Before going into the details, one must need to know what ATM exactly means in real world. It is called an Automated Teller Machine (not Any Time Money!). In other words it can be said that it is kind of a cash point where the cash point is a computerized machine. ATM is a easy-go way for many banks in India as well as to the customers, facilitating their money transactions in an easy way. ATM’s have been themselves to be the backbone of retail banking sector. The idea ATM machines first developed in Japan, UK, USA and Sweden simultaneously. “Bankograph” was the first cash dispenser which was developed by Luther George Simjian in the month of February, 1963. The second dispenser consisting of PIN (Personal Identification Number) was developed by John Shepherd Barron which was known as DACS. The modern ATM has with full modern functionality was first developed in UK in December, 1972, designed by IBM 2984, on request of Lloyd’s Bank. However the banks which introduced the first ATM’s in India are namely Hongkong and Shanghai Banking (HSBC) in 1987. There is much major functionality of ATMs, one if which mainly depicts their abundance is their concept of cash withdrawing etc., to be available 24x7x365. To understand the current scenario of ATM usage in India, let’s have a look at some statistics that gives a glance on growth of ATMs in India. Looking at the growth of number of ATMs installed, total 21,110 machines were registered in the period of year 2005-06, which saw a further increase to 25,247 during the next year. Carrying this marginal growth trend 2007-08 had 34,547 ATM machines, while 2008-09 had only 43,651. India showed a slightly better growth in number in 2009-10 with 57,765 ATMs that rose to 76,871 in 2010-11. The rate of growth of ATMs is increasing exponentially by the end of every year, but it is still not matching the rate of growth of population and its distribution across the country. To top on that, as the usage of ATMs keeps on increasing, the problems that customers are facing with the ATMs are increasing too in a same proportional way to that of the growth of the ATMs. Although the technology is also moving ahead with the growth of ATMs in India, but we have to admit the fact that, not all the ATMs of the retail banking sector are able to use the technology to overcome the problems of ATM vulnerability. Other major reasons for so much rapid growth of ATMs are, its functionalities which include: usage of ATM cards of any bank at any other bank ATMs, paying the bills, transferring money from one account to another, checking the account balance at any time etc. Why is this problem arising? There are many major causes, one of which is the lack of awareness, mainly to the rural customers who does not actually know much about the ATM card usage. As a result, the card can be blocked and again the customers have to roam around the bank authorities. Sometimes the customers are unable to receive the slip showing them the account balance, of course sometimes due to running out of the paper inside the machine and sometimes due to technical issues. Sometimes the money even gets tuck at the end thread, leaving the customer confused, if he should leave the ATM the same minute or to stick back there. Request timed out error occurring if the customer is little slow in entering his/her details. ATM running out of money has also been a huge problem here. However, banks also have a many threats and problems regarding ATMS like, theft, robbery, system problem, network errors, server problems etcetera due to overload and over usage of the means. Also ATMs are not completely free from hackers, who try to hack the bank’s site, thus affecting the whole banking system. Sometimes, ATMs simply decline the transaction showing “transaction declined”, without showing any possible error. The above mentioned are some of the common major problems and their causes faced by most of the customers and also the banks. No new technology is free of risks or problems. At the same time one cannot simply ignore the technology. So, all we can do is to accept the technology along with its side effects and develop the possible best solutions to overcome these vulnerabilities. Some of them are: As soon as any problem is found or complained about any particular ATM, the time to attend it and resolve the issue should be kept as minimal as possible. Bank servers work too slow for the work load they actually bear, so whenever a server goes down, it becomes difficult for the banks to find where the problem is, at the ATM machine or at the bank main center itself. SO, to overcome this particular issue, the bank needs to develop certain error detecting algorithms which makes this error finding job easier. 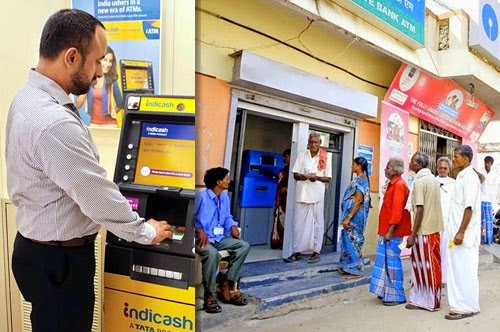 Spread as much awareness as possible not only in written, but also in pictorial form so that illiterates may also find it easy to use the ATM, thus not committing common mistakes that they always do while inserting the ATM card. Make the ATM view available in local languages, which is already practiced by many banks now a days. Now, let us talk about the security issues here. The present security consists of mainly manual and then technical surveillance. Manual surveillance may be improvised much more, but as we all know, never to trust on human instincts as a whole, one definitely needs technical support too. So, the banks must extend their funds to provide more establishes and well improved technical surveillance systems for better security options.